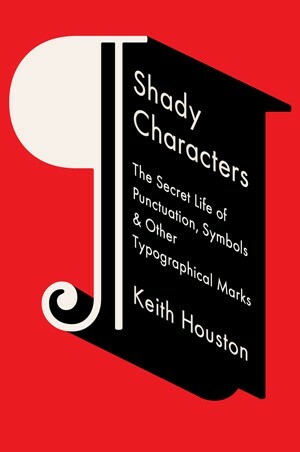 One of the better looking books to land on my desk lately is Keith Houston’s Shady Characters: The Secret Life of Punctuation, Symbols & Other Typographical Marks. Its contents, I’m happy to report, live up to the promise of its stylish cover. Shady Characters builds on the author’s blog of the same name, taking readers on a hugely entertaining journey down the backroads of typographical history. As well as the familiar family of dashes, commas and other stops, it puts us on intimate terms with the lesser-seen pilcrow (¶), at-symbol (@), octothorpe (#), interrobang (‽), and irony marks, among others. If a reader’s interest stretched to a few lines or a paragraph, a manicule’s fingers could be elongated to bracket the required text; in some extreme cases, inky, snake-like fingers crawl and intertwine across entire pages to indicate and subdivide relevant text in a horror-film parody of the hand’s physical form. Very occasionally, manicules were not hands at all; in one fourteenth-century Cicero […] a five-limbed octopus curls about a paragraph, and in a seventeenth-century treatise on the medicinal properties of plants, tiny penises point out discussions of the male genitalia. Was it William Burroughs who first described language as a virus from outer space? I’ve always liked the analogy, though it may be more useful to think of language as a symbiont from inner space. In his book The Symbolic Species (1997), Terrence Deacon describes the language-as-a-virus metaphor as extreme but helpful. He identifies the most basic principle guiding the design of languages to be ‘not communicative utility but reproduction – theirs and ours’. The structure of a language is under intense selection because in its reproduction from generation to generation, it must pass through a narrow bottleneck: children’s minds. Language operations that can be learned quickly and easily by children will tend to get passed on to the next generation more effectively and more intact than those that are difficult to learn. . . . Language structures that are poorly adapted to this niche simply will not persist for long. As language emerged in tandem with the human nervous system – each adapting to the other – it drew on existing cognitive abilities. The facility for language is not the responsibility of some dedicated device in the brain but rather is spread across many parts of it. the neural structures and circuits involved in the production and comprehension of language are homologous to structures found ubiquitously in most monkey and ape brains: old structures performing unprecedented new tricks. Below is a video of Deacon giving a talk in 2010 called ‘Language & complexity: Evolution inside out’. It’s quite a technical presentation (I was grateful for my distant background in genetics and developmental biology), but Deacon is a clear and engaging speaker and his subject matter is deeply interesting. The old view that language functions are confined to a few regions like Broca’s area and Wernicke’s area, or even the left hemisphere can no longer stand. Language processing involves complex coordination between multiple systems. But the modern human brain is a relatively recent acquisition. How did all that complexity evolve and become coordinated? Deacon has some persuasive thoughts on this. Birdsong, some of you will be happy to hear, features quite a lot. The talk lasts about an hour, with a short Q&A at the end.